Service Worker is a script that works on browser background without user interaction independently. Also, It resembles a proxy that works on the user side. With this script, you can track network traffic of the page, manage push notifications and develop “offline first” web applications with Cache API. Basically, a service worker is nothing but a script that is run in the background and by the browser itself. However, it is completely separate from a web page and also offers a host of features that does not rely on the need for a web page. In fact, in today’s terms, we already have seen a number of such implementations such as push notifications, geo-fencing and background syncing. In this tutorial, we shall discuss the core feature, which involves the interception and handling of network requests. This shall also include the ability to manage a cache of responses programmatically. Also, this is a very exciting API to work with since it allows for offline support and thus gives developers complete support over the complete experience. Before service workers invaded the landscape, there was another way to achieve offline experience. This was possible by means of the App Cache. However, it has its own issues and also worked better for single page apps and not for sites with multiple pages. Service workers, so far, have taken care of these issues though. Service workers are designed to handle network requests and assist in offline first development, Push Notifications and background syncs. Communication’s with the webpage must go through service workers PostMessage method. Web workers mimics the multi-threading model, allowing complex / data or processor intensive tasks to run in background. Ideal to keep your UI jank free when you have to deal with a lot of computations. Communication’s with the webpage must go through web workers PostMessage method. Responding to resource requests from other origins. Receiving centralized updates to expensive-to-calculate data such as geolocation or gyroscope, so multiple pages can make use of one set of data. Client-side compiling and dependency management of CoffeeScript, less, CJS/AMD modules, etc. for development purposes. Custom templating based on certain URL patterns. Background synchronization: Start up a service worker even when no users are at the site, so caches can be updated, etc. Reacting to push messages: Start up a service worker to send users a message to tell them new content is available. Reacting to a particular time & date. The installation step in followed by the activation step, where one can handle any of the old caches as well. After this, the service worker takes control over all the web pages that fall under its scope. Note that the page that registered the service worker isn’t controlled until the next time it is loaded. A service worker will necessarily be in either of two states that it can exist in. One is the active state, where it handles messages and network requests through fetch and message events. The other is the terminated state, when it is not in use to save memory. 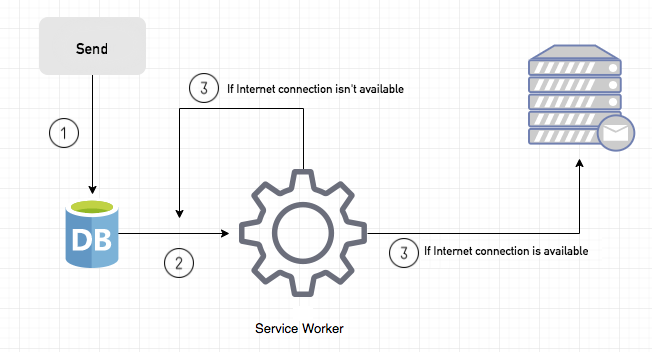 Service Worker lifecycle has 3 step; Registration, Installation, and Activation. Where should we use registration function? You can start registration process every page load if you need. Because this process doesn’t start from the beginning every time. If service worker is the new or updated, the installation process will start. The above example first checks to see if the service worker exists in the browser’s navigator. If so, then sw.js is registered. You must reload the page to complete the process. If you’re using Chrome DevTools, look under the service workers tab in the application panel to see if registration was successful. After a controlled page kicks off the registration process, let’s shift to the point of view of the service worker script, which handles the install event. Here you can see we call caches.open() with our desired cache name, after which we call cache.addAll() and pass in our array of files. This is a chain of promises (caches.open() and cache.addAll()). The event.waitUntil()method takes a promise and uses it to know how long installation takes, and whether it succeeded or not. Now that you’ve installed a service worker, you probably want to return one of your cached responses, right? Here we’ve defined our fetch event and within event.respondWith(), we pass in a promise from caches.match(). This method looks at the request and finds any cached results from any of the caches your service worker created. Make sure the response type is basic, which indicates that it’s a request from our origin. This means that requests to third party assets aren’t cached as well. Background Sync is a Web API that provides to delay a process until Internet connection has stable. We can adapt this definition to the real world; there is an e-mail client application that works on the browser and we want to send an email with this tool. Internet connection is broken while we are writing e-mail content and we didn’t realize it. When completed the writing, we click send button. Here is a job for the Background Sync. In the following view shows classical process sending email to us. If the Internet Connection is broken, we can’t send any content to Mail Server. In here, you can create any scenario for yourself. A sample is in the following for this case. When we click “send” button, e-mail content will be saved to IndexedDB. If the Internet connection is available, all e-mail content will be read and sent to Mail Server. If the Internet connection is unavailable, service worker waits until the connection is available even though the window is closed. When it is available, e-mail content will be sent to Mail Server. Edge and Firefox browsers are currently working on implementing background sync, which is fantastic. It is one of the best features for providing a more empathetic experience for users moving between internet connection and connection loss. Fortunately with a little help from online and offline events and IndexedDB, we can start providing a better experience for users today.